It's funny how the rate by whoscored are useless. The others times Alonso and Thiago got the best rate but were average.. And this time Thiago and Lahm deserves the best rating and aren't top 3. Coman wrote: It's funny how the rate by whoscored are useless. Really interesting build-up play from the team yesterday night, there was really just little few spaces to use for Mainz. The fact we played with only 2 MF changed the way how we had to build-up our game. 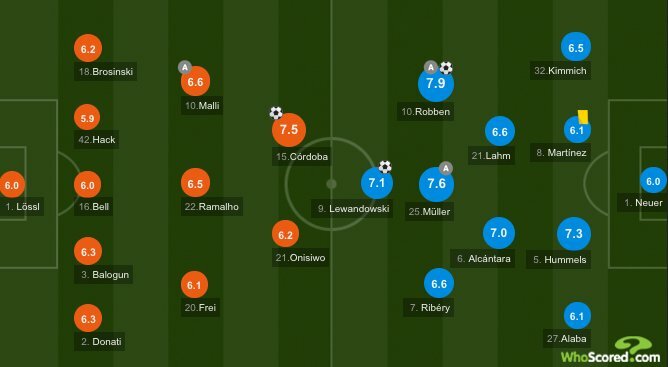 Most of the time, one of Alaba, Kimmich, Ribéry or Müller had to go deeper on the field to help Lahm and Thiago but on the others hand, most of the time, our team was compact and there was no space between the line, because of Müller who was free and using his intelligence to go where there had space. The few problems we say against Mainz were more because of individual dysfunction, like Kimmich or Martinez. About Lewandowski, he probably played so deep because he was alone against 3 CBs. But system did Müller/Robben could use the space where Lewandowski wasn't. Well, on a tactical point of view it was way better but not perfect, specially how our full-back were helped in defense, even if Lahm and Thiago did a great job, it wasn't enough from Robben, Müller and Ribéry. I guess Vidal can secure even more the midfield with his qualities, but instead who ? Lahm and Thiago were brillant overall. I guess the solution is to use Lahm as RB again, but as a RB who help the midfield to build-up our game more than a RB who attacks all the time. Same with Boateng, if his true level come-back, who can help even more the team in build-up and cover Hummels/RB better than Martinez did for 2 games. Lewandowski : "With the new system, we have more opportunities to play offensively. There was much going through the middle. The system worked very well. For me it is important that I have Thomas behind me". Robben : "We played with a ten, with Thomas. This is the key to success. Müller moves open the gaps". BILD: "Bayern have their pace back, because Carlo Ancelotti for the 1st time at Bayern is back to the attacking tactics of Guardiola. The new, old system is benefiting mainly for Müller, who plays liberated". Müller : "When the coach told me that we are playing differently today, I was already looking forward, I was allowed to play on my favorite position and then I had to deliver". Hummels : "It was the first time 4-2-3-1 this season. We felt very comfortable. The change was a minor problem, everyone has played this system before". Lahm : "This was especially good for Thomas. So he could play behind the striker, as always very fast". SPORT1 : "Thomas Müller is the key in the old/new system". Coman wrote: Really interesting build-up play from the team yesterday night, there was really just little few spaces to use for Mainz. Thanks for this post, I couldn't watch the game. Looking forward to seeing more of this (hopefully). I cried from joy yesterday, the guy was absolutely fantastic, literally smashed Mainz midfield and defense on his own will, communicating with Lewandowski with close eyes, supporting Robben and filling all the gaps in our previous offensive system! Ancelotti please keep this style,keep this system and as the time goes by we will climax, slow learner the Italian as it seems he learned though, one thing at a time maybe... Now keep Alonso benched and go for some more robust midfield because the duo Lahm-Thiago against top top teams will bury us to the cement!! Coman's post shows how right we were most of us here about the key-man Muller, his teammates are going out LOUD AND CLEAR about Thomas efficiency and how much they value him as an individual! Ancelotti you got it perfectly right this time now it's time to build on that!!! Wow! Are you saying putting Muller behind a striker has improved his performance? Firefox1234 wrote: Wow! Are you saying putting Muller behind a striker has improved his performance? Now the thing is how could of the most successful coaches in football history NOT realise this in his first 5 months in charge??? ?